Camp will begin at 6:00 pm immediately following the varsity spring practices. Practice will run for 2 hours. Campers can arrive early and watch varsity practice from 4:00 – 6:00. All players who are currently in grades 3 – 7 are eligible to attend. The RTFA also welcomes new players to camp who have not played the game of football before to learn and develop the fundamentals and skills of the game. The academy will be limited contact therefore all players will be in helmets and shoulder pads throughout the week. Players should wear shorts and cleats in order to be fully prepared to participate each day. Athletic supporters and mouth guards also required. Helmets and shoulder pads are issued to registered WTYFC players 5/31. 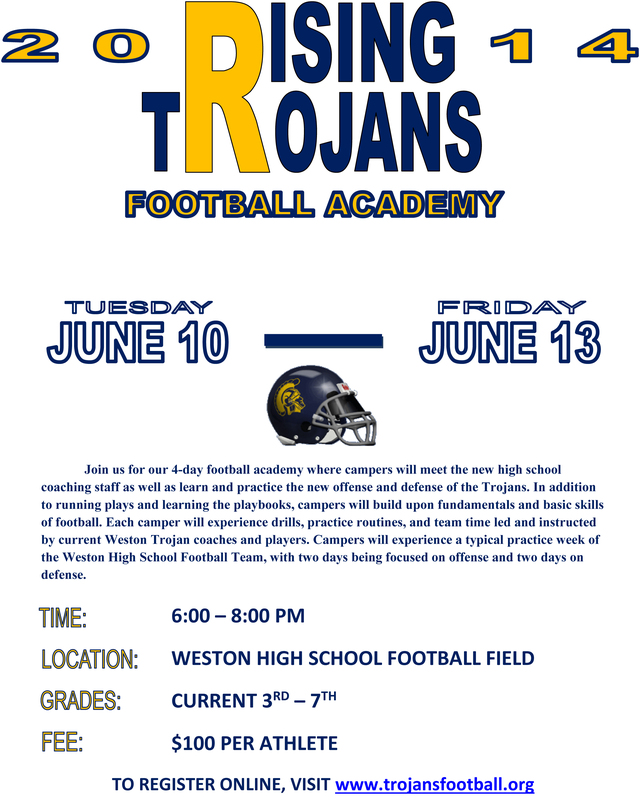 Players not-registered for WTYFC Tackle and interested in checking out the tackle experience, may pick up helmet and shoulder pads on June 10, TUESDAY, 5:00pm, at the Pack Rat at the Weston High School located in the alleyway across from the WMS softball field.